Earlier this month Autocar (followed tardily by Auto Express) reported on Smart’s plans for a new compact three-seat car to compete with Toyota’s iQ and other upcoming tiddlers from the likes of BMW and Audi. The two magazines published images from patent applications showing a McLaren F1-style three-seat arrangement, with a central driver’s seat flanked by two rear-set passenger seats. But we think both Autocar and Auto Express have slightly missed the point. The company is not just planning to fit a central front seat, it intends to make the entire driver’s cockpit – pedals, instruments, steering-wheel and all - slide from side to side. This flexible driving position will allow Smart’s diminutive new car to carry passengers of different shapes and sizes with as much comfort as possible. A fixed three-seat arrangement is of course the subject of a separate patent application from the designer of the McLaren F1 himself – Gordon Murray. And as we explained in an earlier post looking at Murray’s patents and his upcoming T25 city car, a central driving seat creates entry-and-exit issues. Murray plans to tackle these with extra-large door openings, possibly removing a part of the roof or floor along with the door, to remove the need for an ungainly crouch and scramble to reach the pilot’s pew. Smart’s plans indicate it will instead bring the mountain to the man – the driver’s seat will sit on transverse runners, allowing the seat to slide sideways to allow a normal entry or exit, and then sliding back to the centre position for driving duties. Alternatively, if the car is carrying an adult passenger, the driving seat can remain in its offset position on the opposite side of the car from the passenger. 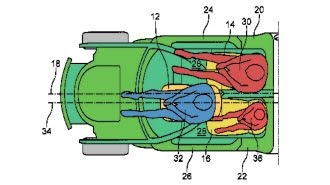 And finally, if carrying a child and an adult as passengers, one of Smart’s patent applications suggests the driver will be able to sit off-centre, to improve weight distribution and to give the adult more legroom during the journey. It took us a while to find the patent applications filed by Smart – Autocar didn’t provide a link and unhelpfully, the documents are listed as belonging to the defunct Daimler Chryser organisation. But by finding one patent by exhaustive means, and then plugging in the name of lead inventor Karl-Heinz Baumann, we think we have found all of the relevant applications. Unfortunately they happen to be in German and we’re not so hot on reading technical documents in a foreign tongue. So we’re not 100 per cent sure of Smart’s exact claims. But it is clear that the world of very small cars has become the focus for some very clever thinking.